The reason for coming up with The Education concept behind The Academy was born after many years of feeling like I was fumbling around in the dark – just trying to work out what I wanted to do when I finished football. First I tried a carpentry apprenticeship, then went to university to study landscape architecture, tried for my pilot’s license, explored the idea of becoming a real estate agent, delved into the world of app creation, mucked around with the beginnings of a few invention – for a while there, it felt like I tried everything under the sun. It wasn’t until I stripped it all back that I finally asked myself the one important question: what do I love doing? I would see young players come in and out of the AFL system, leaving with as much clarity about their future as when they entered. The answer, of course, was – and still is – that I love playing football. But that led to another question: why do I love playing football? Then some great answers started to come to me. What I love most about football is being in a team environment and being in a position to help younger players hone their talents. Every year, I would see young players come in and out of the AFL system, leaving with as much clarity about their future as when they entered. They all loved football, but never thought any more deeply about what they could do with their love for the game, or what it was about the game that they loved so much. I believe this came from not asking the right questions at the right age. To help young people explore the answers in their own lives, I’m sure there’s a more effective way to deliver education. After all, in our final years of schooling, shouldn’t we be focusing on gaining life skills and trying to understand what makes us happy, as well as understanding who we are as people? Instead, there seems to be too much focus on learning for the sake of learning, just to achieve a number that supposedly tells you how good you are in life, when what we really need is more people to ask us the right questions at the right time. I fell into that trap of believing I needed a score to be successful. As it turns out, I haven’t needed that number and I am now doing what I love at The Academy and The Richmond Football Club. Because the truth is that, although we don’t all have the same talents and abilities, we can all be happy and excel in what we do. What I love most about The Academy is that we are sending out the call to all young men and women who have a passion. That is half the battle – understanding what you love. 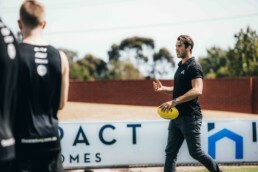 The students at The Academy already know they love AFL – now the ball is in our court to ask the right questions and give them the tools to achieve success in any role within the AFL space. Whether that is as a player, grounds keeper, therapist, accountant or salesman. How will we know that this program has been a success? It won’t be by how many students we get drafted – the fact is that it won’t be as measurable as that. How I will gain real satisfaction is if I can talk to a graduate in 5 years’ time and they can say to me, “you gave me clarity!”, or “you helped me find a job I love and I am good at”. Because the truth is that, although we don’t all have the same talents and abilities, we can all be happy and excel in what we do. It all comes back to whether or not we get asked the right questions at the right time. Alex Rance chats with Channel 7 about the inspiration behind The Academy. Watch it now.